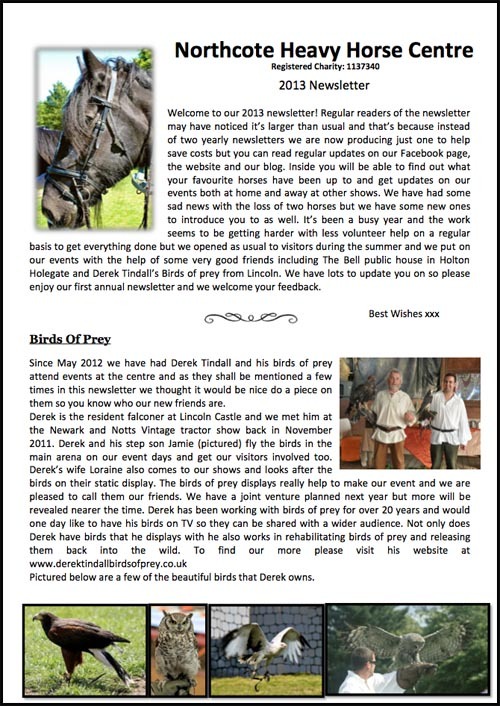 Each year we send out a newsletter to our Adopters, Friends and other supporters. Doing this proves to be very expensive as each newsletter costs 50p to send via a second class stamp plus the cost of printing and envelopes. Because of the high cost we are looking to eventually move most of our subscribers to an email newsletter. This also means we would be able to send out updates in a more timely manner. Please consider subscribing to our online newsletters using the link below. If you would no longer like to receive our newsletter via post please contact us and we'll remove you from our mailings. All of our updates from throughout the year including the sad loss of Mojo, Buster & Rocky. We welcomed Pierre and Blackjack. Subscribe to our email newsletters and get more updates from us directly to your inbox! All of our updates from throughout the year including the sad loss of Duncan, Steve, Scooby & Charity. We welcomed Wendy the shire horses and lost (then found) our new bird of prey! Main updates from the centre including updates from our 2014 events. The sad loss of Cossack, William & Harvey. The arrival of Tiko, Pluto and Merlin. Plus lots more! Main updates from the centre including updates from our 2013 events. The sad loss of Samson and Magnus. The arrival of Moose, Charity and Rosie.